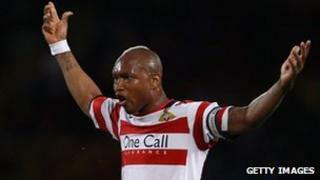 Six men, including footballer El Hadji Diouf, were arrested after a nightclub brawl which left a man seriously hurt. The Doncaster Rovers forward, 31, is understood to be one of five men who were bailed until 23 May following the fight at a Manchester club. QPR defender Anton Ferdinand, 27, is understood to have been interviewed under police caution but not arrested. A 33-year-old man is seriously ill but stable in hospital, said a Greater Manchester Police spokesman. The alleged incident took place at 03:40 BST on Sunday in the Circle Club and the injured man was found close to the Barton Arcade club. A GMP statement said: "Six men were arrested on suspicion of violent disorder, five of whom have been bailed until 23 May pending further police inquiries. "Another man has assisted the investigation, which is ongoing." Det Insp Dan Clegg appealed for witnesses, saying: "This was clearly a large-scale disturbance which took place at a busy time within this club. "Whatever the full circumstances were, this incident has resulted in a man suffering serious injuries. "While we expect him to make a recovery, I want to make it clear that there is no place for any form of violent disorder in Manchester city centre. "While I understand there will be a lot of speculation surrounding this incident, we just want to know what happened." Mr Diouf, who appeared for Senegal in the 2002 World Cup and has previously played for Liverpool, Bolton, Blackburn and Sunderland, did not play in Doncaster's 4-3 defeat by Portsmouth on Saturday, which saw them relegated from the Championship. Mr Ferdinand, who was a team-mate of Mr Diouf's at Sunderland and is the brother of Manchester United and England defender Rio, played in his club's 1-0 defeat at West Bromwich Albion on the same day.